Brother Jesse Blog: No Grand Jury in Trayvon Martin case?! The Dream Defenders block entrance to Sanford Police Station demanding justice: "The American Spring Is Upon Us." No Grand Jury in Trayvon Martin case?! The Dream Defenders block entrance to Sanford Police Station demanding justice: "The American Spring Is Upon Us." In recent developments in the shooting death of Trayvon Martin, special prosecutor Angela Corey, who was assigned to oversee the controversial case, decided to forgo a grand jury that was scheduled for Tuesday, April 10. The grand jury was cancelled. This has many wondering what will be the fate of shooter George Zimmerman, who has yet to be arrested or charged since he unloaded a bullet into Trayvon on Feb. 26. Regardless of the news cycles, many refuse to slow down their efforts in demanding justice for the teen who was only armed with a bag of Skittles and a can of ice tea the night he was killed. This case has given birth to The Dream Defenders. According to their website, it was founded on "the idea that students and young people must come together, casting aside petty differences and organizational affiliations, to build a true movement of the People. We are dedicated to defending the dream etched in our memories by Dr. Martin Luther King: that we are all created equal and possess equal rights to life, liberty, and the pursuit of happiness...We are not an organization. We are an idea. An idea that cannot be quelled or silenced. We are diverse: students, alumni, black, brown, and white, young and old. We are a generation of world changers, writers, readers, rebels, marchers, dreamers, leaders, thinkers, organizers and activists. We are aware and we are angry. This revolution cannot be simply reposted or retweeted. Our legacy will be defined by decisive action." 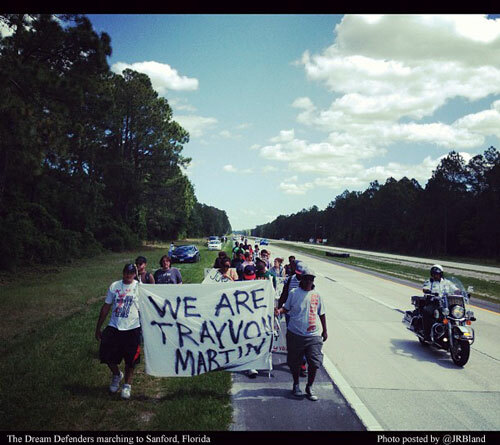 On Easter Weekend, The Dream Defenders met at Daisy Stocking park in Daytona, Fl on April 6 and marched for three days to Sanford, FL to demand justice for Trayvon and an end to the Jim Crow system still alive in Florida. 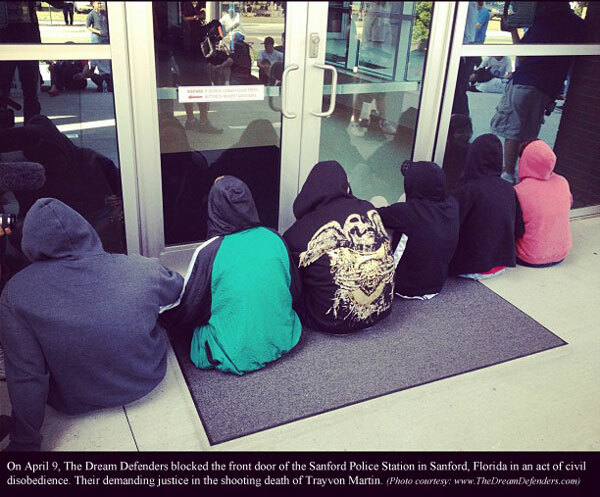 Upon arriving in Sanford on April 9, they blocked the front door of the Sanford Police Station in an act of civil disobedience. The following local and national demands are being presented by The Dream Defenders with the intention of holding law enforcement accountable for the execution of or compliance with racially motivated violence: 1) Arrest George Zimmerman, the murderer of Trayvon Martin. 2) Fire the Sanford Chief of Police Bill Lee for failure to act responsibly in response to the case. 3) Create a Sanford Police review board, with a member base that is racially diverse and representative of the community. 4) Calling of a nationally broadcasted Congressional forum on eliminating racial inequalities in the U.S.
"We will not stop until Zimmerman is arrested, Sanford Police Chief Bill Lee and Sanford City Manager Norton Bonaparte Jr. are permanently removed from office, a full investigation into the handling of the Trayvon Martin murder by local law enforcement and the state attorney, and the immediate prosecution of those found to have committed any wrong doing. Sanford is our first stop, we’ll see you soon Tallahassee, Charlotte, and New York," the group says. "The next few months are critical for our Nation’s history. The time is now. Do not delay. We are the ones we’ve been waiting for. The future is today. The future is Us." For more information on The Dream Defenders visit their website at http://thedreamdefenders.com/ and follow them on Twitter @DreamDefenders. They have declared that the "American Spring is upon us." P.S. : The following image below was posted on Twitter. 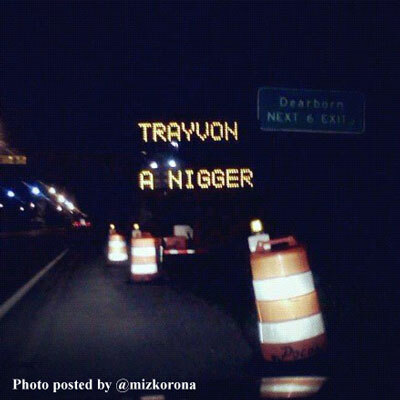 Someone reportedly changed this digital sign in Michigan. Welcome to post-racial America, people!